Avoid salty language around Polly if you don't want her to repeat it. You may not want your African Grey to learn to talk your ear off like your mother-in-law and best friend do, but with patience, you can teach her to speak a few simple phrases. You'll have the greatest success if your feathered friend is still young and in good health. Imitate a bird sound that the African Grey previously made, such as squawking or cooing, which will be the first step in teaching her how to mimic you and also help gain her trust. Close the door if you're worried that somebody will hear you making odd bird noises and be concerned about your mental health. Repeat the bird sound until she imitates you. Reward her by scratching her head or feeding her a treat. Talk to the parrot just as you would a human infant in a soothing, clear voice. Start by repeating short phrases to her. Speak slowly and be patient with her, just as you would a young child who is learning a new skill. Constant repetition will help the feathered friend catch on faster. Try including some words that begin with "B" or "P", such as "Pretty Bird," which are simpler for parrots to speak, according to Dr. Greg Harrison of the American Board of Veterinary Practitioners. When she successfully repeats a word or phrase, reinforce it for several days before moving on to a new word. Use words that describe your actions so she can begin to make the association between the two. For instance, say "Hello" when you enter the room where her cage is, "Goodbye" when you leave and "Good food" when you feed her. Bid her "Goodnight" when you cover her cage at the end of the day. Don't become discouraged if you don't see immediate results - it may take several weeks of repeating the process before the African Grey finally catches on and speaks. Speak enthusiastically -- your feathered friend will more easily learn phrases that have strong emotion behind them. For that reason, she may also pick up words or phrases that she overheard that you'd rather she not repeat, such as "Shut up!" or "I hate my boss" or your favorite 4-letter word. So watch your language around your feathered friend, because she could parrot what you say at inopportune times, including around children. If you say "I can't stand my mother-in-law" to a friend on the phone, don't be surprised if Polly repeats your sentiments when your in-laws are over for dinner. 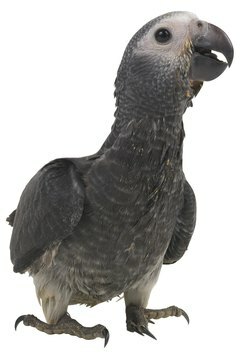 Name the food and toys you give your African Grey, so she can learn to identify objects with words. Say "seed" when you refill her food dish, or "apple," "grape" and "orange" when you give her a slice of fruit. Do the same with her favorite toys -- say the word "bell" when she rings the bell in her cage or "string" when she plays with one. Reward her with the appropriate food after she successfully names it. For instance, if she says "nut," make sure to feed her one. During the African Grey's first two years, make sure her cage is filled with stimulating and interesting toys to help develop her mind and make her feel content. Turn off the radio, television and computer when you're attempting to teach your parrot how to speak. 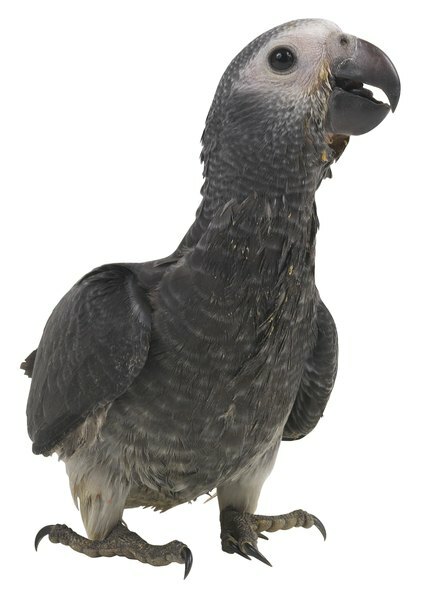 African Grey: How Long Does it Take to Train a Parrot to Talk?